Hopefully you all enjoyed Part One of my look at Bacchus Brewing Co.'s New Zealand Single Hop IPA pack. If you haven't already read it you can find it here. If you can't be bothered clicking through to that here's a little bit about the pack, taken from my last review. Last time we looked at Rakau, a pine and stone fruit dominated hop, Nelson (Sauvin), the most unique hop that comes out of New Zealand and Wakatu, a hop that is normally used in lagers and has citrus and floral characteristics. In this review we are going to look at Waimea, Riwaka and Pacific Jade. Hopefully these are as impressive as the last three were. I was so excited for the Waimea IPA that I kicked off with it. It's a relatively new hop, first released in 2012, but despite this I'm very familiar with it. Waimea normally is packed full of citrus flavours and has just a little bit of pine. 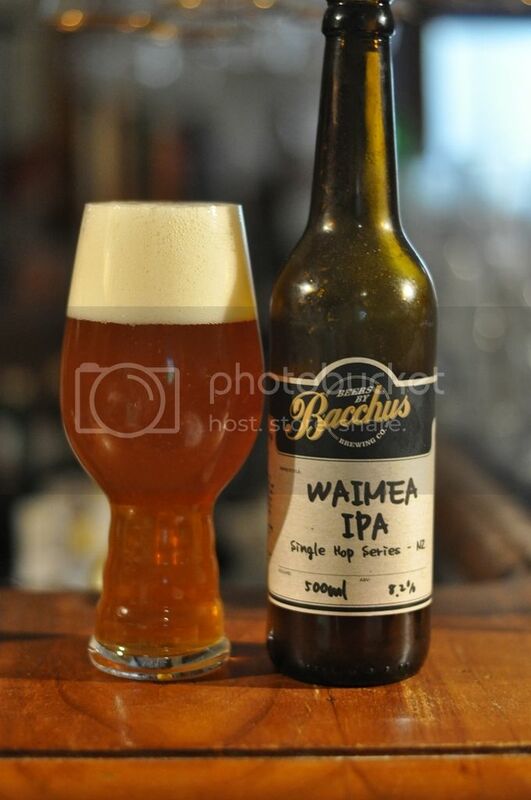 I've previously tried Waimea in a Single Hop IPA in the BrewDog IPA is Dead (2013) review, it will be interesting to see how Bacchus' stacks up. True to form for the series, this beer showcased the Waimea hop very well. It had good citrus characteristics with lemon and grapefruit the most prominent. There is also a some resinous pine, but it definitely plays second fiddle to the citrus. This one also seems to have a bit more malt presence, whether this is because Waimea is a less intense hop I'm not sure. Next up I decided to keep it in the family and move to Waimea's grandparent; Pacific Jade. This hop was released in 2004 and is another hop that is more commonly used in lagers. Like it's younger relative it typically has good citrus characteristics and light bitterness, although Pacific Jade also has a peppery spiciness. 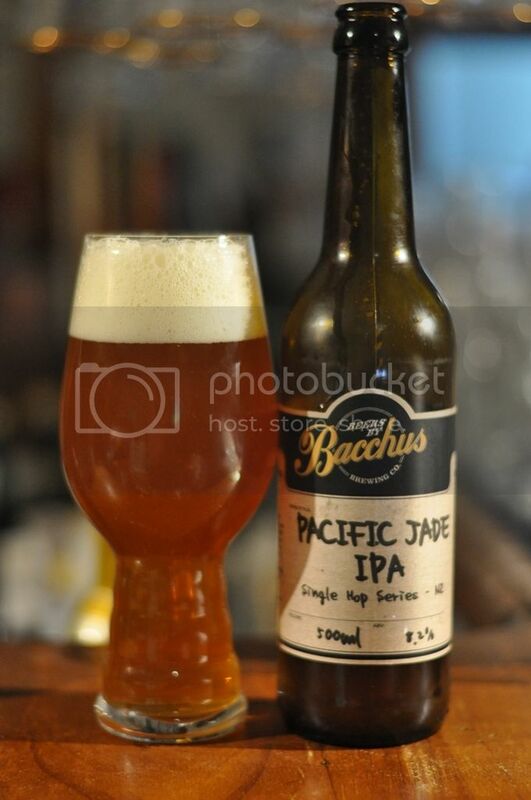 Bacchus' Pacific Jade Single Hop IPA really surprised me; it's a much better IPA than the Waimea. The bitterness is again restrained and the citrus flavours are very similar. The real standout though is this peppery spiciness, which really adds a layer of complexity to the beer. Some earthy malts come through and balance the beer. 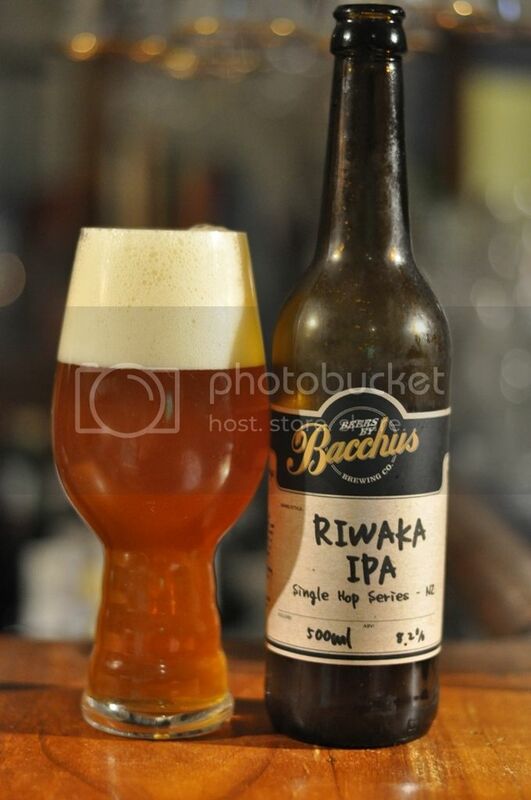 Riwaka is the oldest of the hops in today's review, having been released in 1997. It's a widely used hop and is known for it's strong grapefruit characteristics. It's also known as a particularly oily hop, which may not mean much to non-IPA drinkers, but to those who know their hops it's a wonderful characteristic when used correctly. This IPA was packed full of grapefruit and was surprisingly oily. This was probably my least favourite of the IPA's I've had from this series to far. It wasn't quite balanced, the hops didn't gel with the malt base the way I would've liked. There was this light spiciness at the back end which was quite nice. It was still a 3.5 on Untappd, far from a bad beer - just not the best. 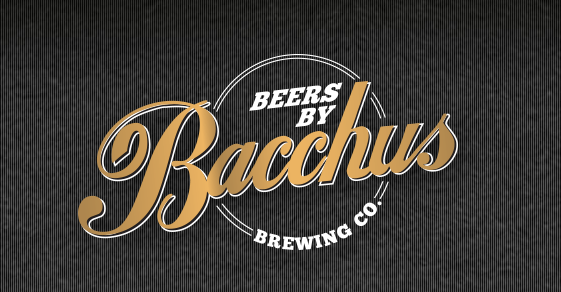 There we are guys; another 3 Single Hop IPA's from Bacchus. All of these hops came out of the same Hop Research facility in Riwaka and they share similar characteristics. Citrus and spices play a role in all of them, but particularly the Pacific Jade. We've got three beers left to complete this series, Motueka, Wai-iti and the Mixed IPA (all 8 hops combined in one). Hopefully you'll join me in a week or two when I get that up.